Have you ever been on a whale watching tour? Whales are notoriously shy and very few tours can promise a sighting. Many hopeful whale watchers return home having seen little more than a pretty sunset over the ocean. There are only 12,000 blue whales in the sea, so they're a particularly exciting sight. Blue whales tend to keep to themselves, far from boats and prying human eyes. Not this whale! He was preoccupied with the day’s tasty meal and hardly even noticed a boat packed full of humans. Passengers were privy to one of the most up close and personal encounters you can get: a view of the animals tonsils as he came straight for the boat while feeding. His huge jaws reentered the water just centimeters from the boat’s edge, splashing spectators in the process. Blue whales are the largest mammals the planet -- it's difficult to fathom their immense size. According to National Geographic, they can grow to over 100 feet long. The distance between home plate and first base is only 90 feet. They’re shockingly heavy, too. Estimates place this large creature’s tongue at about the weight of an elephant and its heart around the weight of a car. Its stomach can hold up to 2,200 pounds. The Blue whale only eats krill and copepods, but you still don’t want one chomping on your boat! An animal this size could do quite a bit of damage. Though rare, collisions between whales and boats do happen. The boat usually loses. In 2010, a 40 ton Southern Right whale crashed into a small yacht in South Africa. No one was hurt, but the boat won’t be sailing anytime soon. 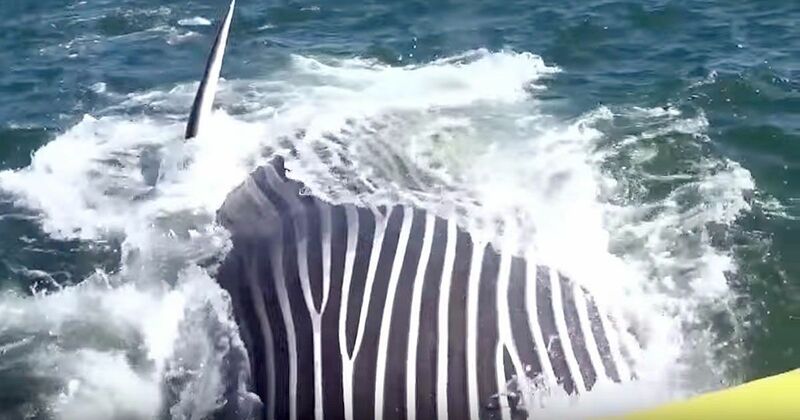 Boats accidentally clip whales more often than whales accidentally smash boats. Scientists think this may be why Blue whale numbers remain low despite conservation efforts. Don’t worry if you’re a casual boater – you are not the problem. Massive cargo ships are the ones responsible for most whale hits. The World Wildlife Fund is protecting whales by tracking their preferring routes and working to keep cargo boats elsewhere. You can help by adopting a Blue whale. Conservation seems to be helping, as the number of Blue whales worldwide is on the rise.